Earlier this month I posted a recipe for parsley baby red potatoes and I still have a partial bag of those baby reds that are threatening to sprout. 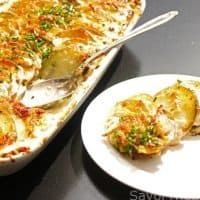 I used some of them last week to make this recipe of rosemary potato gratin for dinner one night and we loved them. 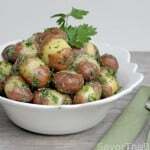 I will be serving roast lamb for Easter Sunday dinner as well as some nice beef steaks to grill for the non-lamb-lovers and these potatoes will be a perfect side dish. 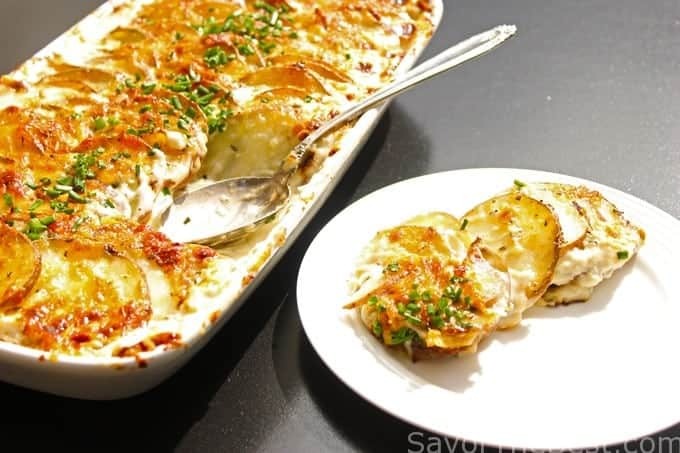 Another great main entrée that is often served at Easter is spiral ham and this rosemary potato gratin would be a great accompaniment with ham as well. I used my mandoline to slice the un-peeled baby reds. 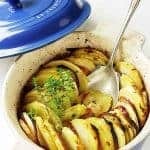 They were added to a large bowl along with the rest of the ingredients, then tossed together and put it into a gratin baking dish. The cream and cheese give it a smooth creaminess while the fresh chopped rosemary and lemon zest enhances and adds depth to the dish. I cannot imagine Easter dinner without fresh asparagus and will also be including roasted fresh asparagus served at room temperature. I am thinking a fruit salad would be lovely with this dinner and Dahn will be bringing our dessert. She has not told me what she is bringing but whatever it is I know it will be spectacular. 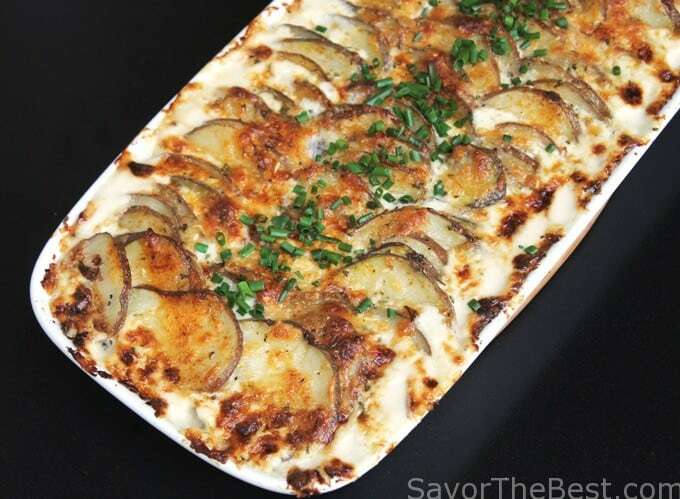 Prepare a gratin dish or a shallow oven-proof baking dish with butter or use non-stick spray, reserve. 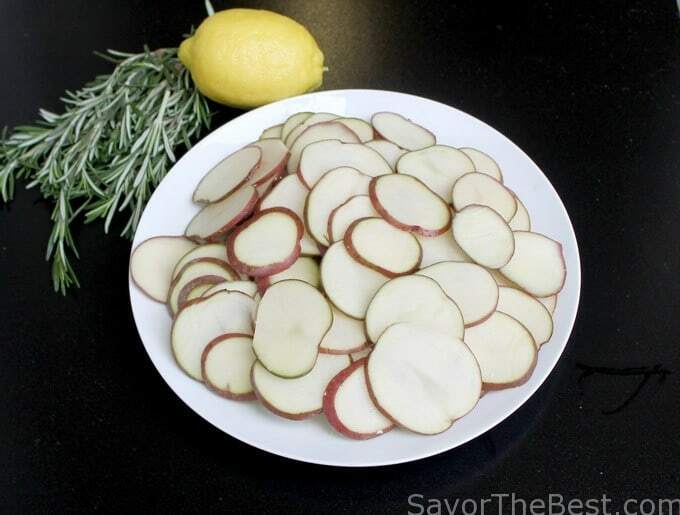 Rinse the potatoes under cold running water and slice them 1/8-inch thick. Place them in a large bowl, add the cream, chopped rosemary, lemon zest, cheese, salt and pepper. Toss to combine and transfer the mixture into the prepared gratin or baking dish. Transfer the dish to the oven and bake for 45 minutes or until bubbly and golden on top. 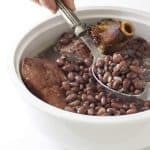 Remove and serve immediately with the chives sprinkled on top as a garnishment. I used a mandoline to slice the potatoes but you can also slice the potatoes using a food processor with a slicing attachment of 1/8-inch thickness. That is such a BEAUTIFUL dish of potatoes. I love everything about it! I love a good, cheesy gratin. 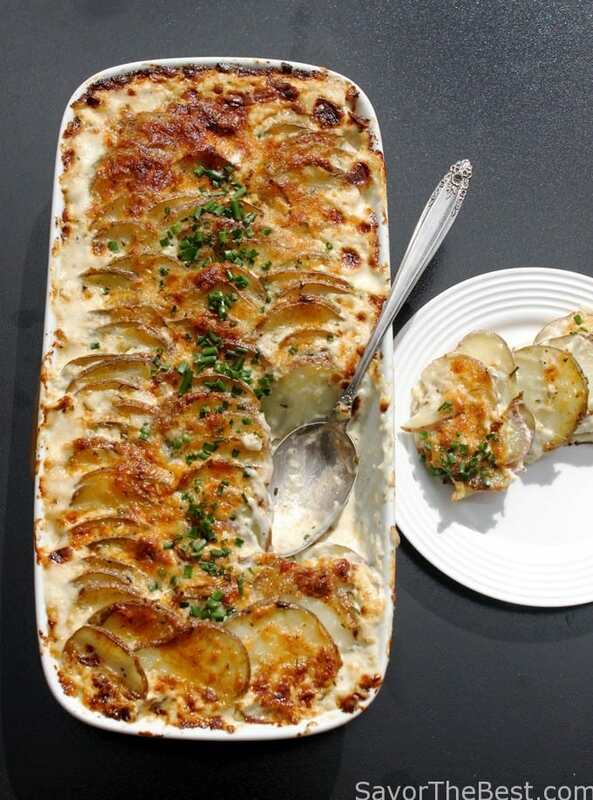 And potato gratin might be the best of all. I’ll be making something similar for Easter, too! Thanks, John…have a great Easter celebration!